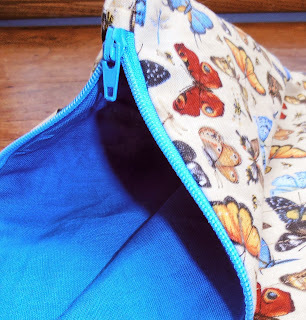 Chair in the Shade: Sew Crazy Challenge- Pin Tucks! 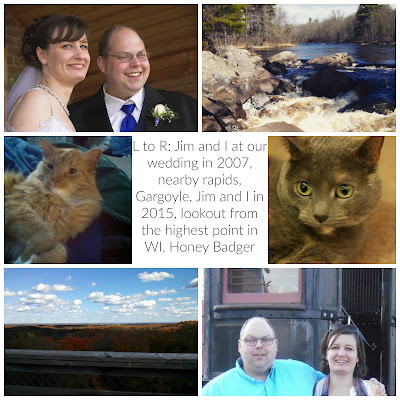 So I mentioned in my New Year's Resolutions that I was going to try to follow Crazy Little Project's Sew Crazy Monthly Challenge. Well, last Monday they issued the challenge. There were four options: begin the learn to sew series, sew a maxi skirt, practice zippers and pin tucks, or work on applique. As soon as I saw pin tucks, I knew that's what I wanted to try. 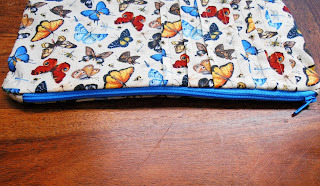 I love pin tucks, but have never sewn any. I'm pretty proficient with zippers, but their tutorial showed a different method that I hadn't used before so I decided to give that a try too. The tutorial is at Simple Simon and Co. and after reading it and trying it out, I'm not sure why pin tucks scared me. I chose some butterfly fabric that's been in my scrap bin for quite a while. I think I only bought a half a yard of this to start with. It's a busy print, but it really needed something to jazz it up. I think the pin tucks worked perfectly. 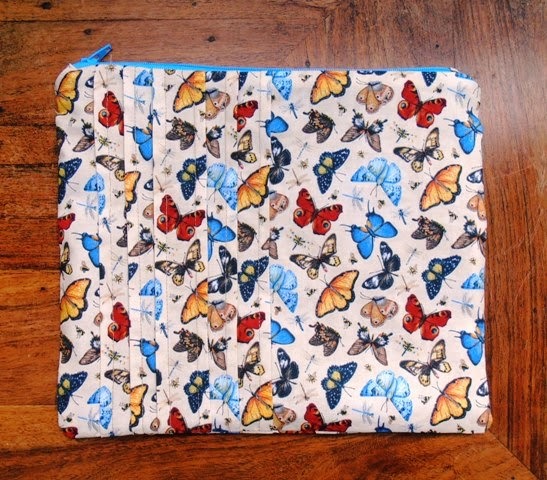 I put in six tucks, and pressed the first three to the left and the second three to the right, which caused a strip of butterflies in the middle to stand out. I really think it turned out cute. It's hard to see the zipper, but by adding a tab of fabric to the start and end of the zipper, it really gives your pouch a more polished look. I think I'll definitely use this method in the future. I also can't wait to see what the February Sew Crazy challenge will be!